These Wall Clock Plaques are finely-crafted timepieces, personalized with a touch of class. 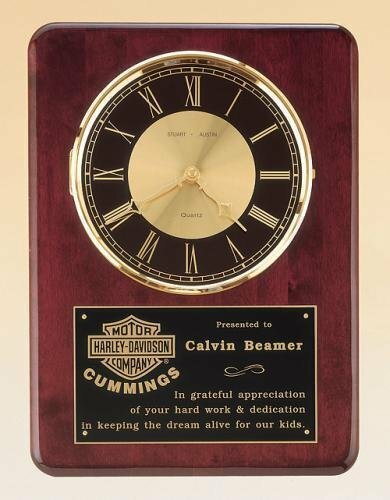 All of our engraved clock plaques have a quality quartz movement, and are individually boxed for gift giving. Batteries included. Rosewood Piano Finish wood wall clock with solid brass diamond-spun bezel, glass lens, gold & black dial and three hand quartz movement. Laser engraved plate. Individually boxed.